To start with, I would like to extend my gratitude to all my readers for voting me as India's third most humorous writer in the recently concluded indibloggies poll. The vital statistical information of the poll is added here. I bow down to all my friends who voted more than once from proxy ids. The results of this year's polls has taught me to be more vigilant and competent for next year's finals. I promise to create many e-mail ids before next year's poll. Moving on to today's topic, I am gonna write about one thing that gets on my nerves every time i go online. I am talking about Farmville. Farmville is an addictive game application found in facebook.Farmville fans can now enjoy the addictive farming game on http://www.farmville.com/ and bypass the Farmville Facebook App which they have been using so long. You still require to connect to Facebook for log in, so that you can retrieve your saved game and level, but the interface is much better. I was never sucked into the Farmville Craze even though, I was once forced to join Farmville by one blackmailing friend of mine. Let me tell you, how i was tricked to join farmville. It was a cold November night. I was online and I was asking my friends to vote for my blog in the indibloggies competition. My friend Meera happened to be online too. I should have kept quiet. But out of sheer greed to get one more vote i started a conversation with her on Facebook chat. Chrony : Hi Meera. Ssup? Meera : Tell me. I am busy. Chrony : Ok I'll make it quick then. Do vote for me in the indibloggies poll in the humor blogger category. Chrony : and that is..??? That's how i joined farmville. out of the 161 votes, Meera's vote was because of farmville (Thanks to farmville). Every farmville expert would have seen this brown cow in their farm. It is not just an ordinary cow. It gives chocolate milk. What can one do with virtual chocolate milk? I am at least ok with the brown cow roaming around in the farm. But I could never digest the existence of the lonely pink cow which gives strawberry milk. We should be really vary of these cows. They have the audacity to give milk in different flavors but still end up getting lost in various farms. The moment i see them with their innocent faces, i feel like punching them. I would have done that, if i were using my friend's laptop instead of mine.Where on earth can you find a pink cow? I haven't seen one in my entire lifetime. I have seen a pink bull though. 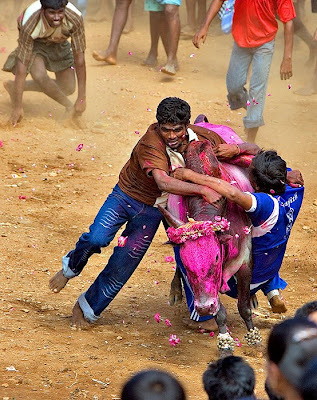 I saw the pink bull in a jallikattu ( The bullfight of Tamilnadu). I was just thinking whether it would give strawberry milk too. If you are a smart reader, you would have said," Hey Chriz! But one cannot milk a bull". To all those smart readers, i have one thing to say," Try milking the pink bull. You will see it smile"
Chrony : Hi bro.. Howdie? Suresh : Hi Chriz.. I am ok. How you? Chrony: Just ok? You are just married for a week. Chrony : Why do you sound so down? Any problem with your wife? Suresh : Things were better when I was single, bro. Suresh : Its 11.30 P.M and she is playing Farmville. I wouldn’t be surprised if Farmville is cited as a major reason for future divorces around the globe.A public message to Mrs. Suresh: I hope you would have understood your mistake by now. But I would rather prefer you to continue playing Farmville, because I am pretty sure that you would have a quality time tending your crops at Farmville than spending it with Suresh. Does he brush his teeth at least now? My collegemate-Robert, who once had the habit of pelting dogs with stones especially during the dog-mating season ( I have no idea why he was jealous) is also in facebook and he plays farmville too. He is very gentle to his ducks, turtle and all the farm creatures. I can't believe it. I would have earned the wrath of many of my friends through this post. But that doesn't stop me from saying this to all my facebook friends, "One more farmville request from anyone,I will surely massacre all your animals in the farm and eat them up.I would not stop there... I would chop off all the plants in your farm and burn your crops and would even cut your pink cow's tail. ROFL.....i share d same sentiments bro.....n i feel srry for suresh too:D..
my my...how true!! its so so so irritating the whole farmville thing!! and i hear there is fishville too?? gah. help! first it was the mafia wars,then this!! uff. loved the post. feel sympathy towards suresh,of course.and i know robert like people too!!! Congos 4 d 3rd place!!! Meera Parameswaran drove you to Farmville ? Wow!!!! hehe! Chris looks like my PC is your good friend? eh? Because as soon as i open farmville, it shuts on me *tup* and I'm all blank. Lol. Its been very long since I've opened farmville. But my sis maintains it for me now lol. And trust me i started hating farmville because everyone is buying loads of stuff and my PC never lets me open my farm. So i hate it now. And hey lol@ the straw berry milk :P I wish there were real pink cows! would have made it so easy for the barista guys who always take so much time making a strawberry smoothie for me. well i wouldnt lie...but i too got kinda addicted to farmville and managed to reach some level 17 or something..and post that i havent looked back it..so totally hate the game!! Congo! for the third position. Next time am sure u will be the winner coz i will definitely vote for you. I was away so wasnt aware about the contest. Oh yes everybody seems to be bitten by this farmsvilla bug. My friend has no time for me coz she is all the time busy reaping or planting virtual crops on facebook. I truly empathise with your situation. Chriz my brother n I are rolling here reading this post. I play farmville and tend to virtual ducks n chickens n pigs and turtles but I swear I have no pink or brown cows and I have never sent you and invitation to play this stupid dung of a game. But my god this post is hillarious, I hope this keeps your persterers or blackmailers at bay. LOL. Seriously farmville irks me! Best way is to block the application totally! No updates, no invites = no spam! crap! Farmville rocks! I play farmville... I love it! i never played it but i joined it because some frnds want me to be their neighbor :P..this can be main reason for divorce also :P..
pappu : first prize kedachurndhaa mattum renu enna kedaikavaa poraa? meow : yaar andha victim? cinderella : the siblings are fine now? You spoke of your joining farmville in a tone that reminded me of exciting kid stories my dad told me (when I was a kid, not he, of course. :P). I agree with you. I loathe Farmville too down to the last details though I do not know much about it y'see. :D. Nice message at the end - it would make more sense if we even thought of real farmers let alone help them. Pink cow story was typical Chriz stuff! He is very gentle to his ducks, turtle and all the farm creatures. Do you mean he doesn't punch his laptop screen!!! Try that, you might end up as knuckle boxing champion. Btw, these days a mechanic in Nehru Place uses my laptop as a punching bag ,and all my neighbors are scared to hell of my punches. You see, I needed that bargained laptop for my practice. Nice message at the end. Cheers and sorry for the long, boring comment. Farmville is indeed a silly game, be smart and play age of empires, quake three arena and Tomb raider. lol..loved it...i get umpteen invitations to join Farmville and it just irirtates.. and where in this world do u find a 'pink cow'?? And Congrats!! write more and be Indias Number One Next year :) My vote is Confirmed!!! Hehehehe that was hillarious man. Rofl... Poor pink cow :) im new to farmville and all my crops have already rotton. Congratz on 3rd rank. Pink cows giving strawberry milk ? Wow !!! 10 years from Now, for sure your friend suresh would wish for a Farmville!! Anyways convey my wishe to him. Chriz...heaven sake, what a co incidence! I am on FV too..be my neighbour.. I promise to vote you in all seasons of blog polls..lolz..
omg you're so so so right! I was working on my physics lab and consulting my partner through fbchat. And she was taking so long to reply. When I finally began to yell at her, she said she was busy tending her crops! And I was like wth, I'm trying to figure out the exponential change in energy and you're... making virtual crops/cows/ducks? haha People's addiction to that game amazes me. i play farmville.. i love beautifying the farm ... though its painstakingly boring..
hey cool blog..if there was a 'pple who hate farmville' club, i wudve been the president! !the game is soo senseless..n on top therez yoville n fishville..so irritating!! keep writing such stuff!! Greattt work! Loved it..
And yup...join the club..I hate Farmville too...dunno whats so addictive about it...its so repelling! haha i swear! sometimes i feel like i'm the only one on this planet who doesnt play farmville. i donno. online games were never my thing and farmville..well for some reason the name kinda turns me off? lol. and congrats on getting voted 3rd! yay! He he.. Loved this post.completely hilarious..Though i was once addicted to farmville too..loved da game..thankx 4 da link.by da way.. how do u know so much bout da game? Did u try it as well.. Lol..
hey Do u mind if I link this page on my Fb ? I too share the same sentiments ! What about the green alien cow that gives Milkaton?? good to see someone who has not been sucked into farmville addiction. i've successfully resisted it so far. i've heard it can be terribly addictive, with no turning around once u get hooked. congrats funnyman :D.I left the farm and moved back to the city a week ago and i dont regret it at all.I thought there was an option to grow weed but man,..i was disappointed.All i got was ugly ducks and a pink cow.What the duck! Hey Chrony! Happy New Year! Congrats on being chosen the third idiot! i was so addicted to Farmville that am now out of it tired and angry! there is no end if u start playing it. Hey Chrizzy. I know its been really long since I commented here :( Just dropping by to say that I posted.. Check when u r free bro..
my BF made me get addicted to FV and now we are enjoying our relationship even more. Hahaha...love the post! I hate farmville too! I'm really tired of seeing the updates everyday! and I've got more than 20 pending Farmville requests! I heard there is even an alien cow! hahaha!! Loved the post...how true - Oh God, how much I hate Farmville. I am going to share this link on my page - hope at least one person gets the message. Farmville in facebook stopped working...............any idea why? great insight into the farmville superstar's lives...!! !